The Boogens (1981) | Who Killed Orrin Grey? I ask you, how could you not want to see this movie? Before I get started, though, some backstory. When I was younger, I got most of my movies from the local grocery store. They had a little video section and every movie was, I dunno, a dollar, something like that. A small enough amount that I could rent a lot of them, and I did. I rented pretty much everything in their modest horror section, and certainly anything that promised to have a monster in it. I never rented The Boogens, though, and I couldn’t tell you why. Probably, it wasn’t actually at my local grocery store’s video section. Probably I saw it’s cover when I was in some other video store or something, far from home, and never got the opportunity to check it out. (A similar thing happened with Spawn of the Slithis, which I still haven’t seen.) Whatever, I remember the cover/title of The Boogens really intriguing me, and so now that I’m (ostensibly) an adult, and my ability to track down random movies is exponentially increased over that of my youth, I finally got a chance to check out The Boogens last night on YouTube, thanks to the heads-up of TCM’s Movie Morlocks. (There’s a lot of other gems of debatable virtue at the other end of that link, for those who wish to explore.) I’ll go them one better and embed the whole video for The Boogens at the bottom of this post, but I warn you that it’s up without the permission of the copyright holders, and so it’s probably not long for this world. 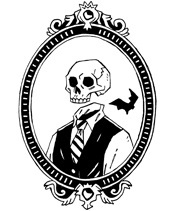 So, is The Boogens worth checking out, I’ve already had someone ask me over on Google+? And I guess my answer would be a not-too-committal “sure.” It’s called The Boogens, and there are monsters in it, and if you’re me that’s enough that you’ll not be able to rest entirely easy until you’ve assuaged your own curiosity, but for others, I’ll touch a bit on it. 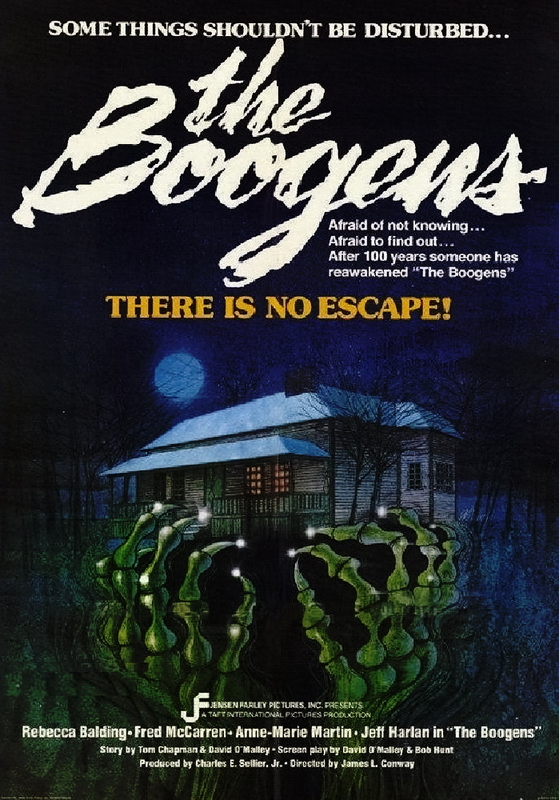 The Boogens isn’t a classic, and for good reason, but it’s also not bad at all. It’s really a harmless movie in almost every sense of the word. It’s surprisingly good at the things you wouldn’t expect a monster movie to be good at, and surprisingly bad at the ones you would expect it to be good at. The story concerns a bunch of monsters who come out of an underground lake in an older silver mine when a mining company sends an advance team down to get the mine ready to re-open. It’s not the first time these creatures have menaced the area, and in fact they’re the reason that the mine got shut down to begin with, as is hinted to us by the old newspaper headlines that the opening credits play over. The chief problem with The Boogens is that not much actually happens. There are only a handful of characters, and not many of them actually get killed. There’s no cold opening, and the first death doesn’t come until twenty minutes into the movie, and nobody really figures out that there even is a danger until the film is almost over. This might work fine, if the movie did a better job of creating a sense of mounting dread, but it really doesn’t do that, either. (The direction is all pretty workmanlike, which makes sense given that the guy behind the camera mostly went on to do about a million episodes of various television series.) 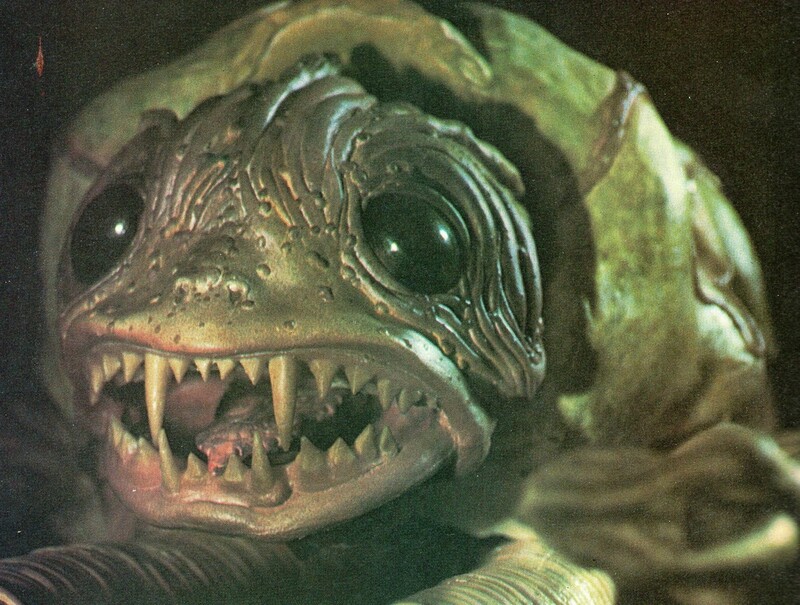 There’s a lot of monster vision, that standby of 80s monster flicks, and when the monsters do finally show up, they’re kind cool weird tentacled turtle things with cute faces, but they’re not anything that’s going to compete with the classic monsters of other films, and you don’t get to see them at all until the last few minutes of the movie. Spoilers! No seriously, this is as well as you will ever see this thing. Weirdly, some of the film’s biggest strengths are its characters. While the writing isn’t exactly whip-smart or anything, the characters are all appealing, and, more importantly, their relationships feel real. I wasn’t expecting a lot from the opening reel, which established our lead and his buddy as the usual bland guy and horny friend dynamic, but once the other characters were introduced their group actually seemed like people who really cared about one-another, which made the deaths, when they finally came, hit harder than I would have expected. Also, the dog, which is normally going to be there entirely to annoy me, is actually great pretty much the entire time. Go dog! The film is also shot mostly on location in Utah (and a little in Colorado), and the landscapes are as great looking as that would imply, though again, the camera work doesn’t really do a lot to take advantage. Ultimately, when I sat down to watch The Boogens, I expected it to be pretty perfect We’ll Send Him Cheesy Movies fodder, either surprisingly great or laughably terrible, but it hit an odd spot in-between. Good enough that I wish it was better, but not bad enough to be bad. A movie that’s probably worth checking out, but that isn’t good enough to recommend. So if, like me, you’ve been intrigued by the title or cover or trailer of The Boogens and want to know if it’s worth your time, I guess my overwhelming recommendation is that you could do worse. Especially if you get around to it before the rights owners pull it back down off of YouTube. I just want you to know that we watched this, and later named a monster after the Boogens in question, when nothing else came to mind (I was asked to come up with a monster on the spot). It seems like thing kind of thing you’d want to know! That is EXACTLY the kind of thing I’d want to know!